It’s amazing to think that three months ago, my wife and I stumbled onto the information we needed to tackle travel rewards. Not only did we dive right into the plan, but we have also been rewarded for our effort. 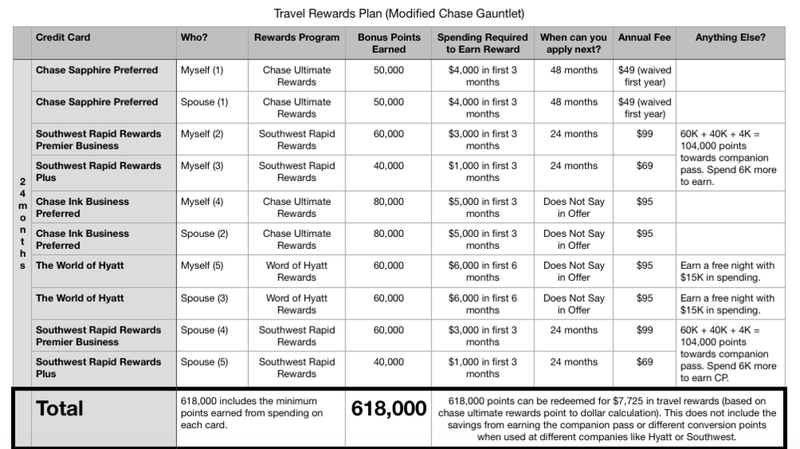 As you might recall in our article from October, I created a plan that started with two Chase Sapphire cards followed by two Southwest cards in an effort to earn the Southwest Companion Pass (You can look at the plan below). I modified our plan slightly as I discovered that I was only 60,000 points away from earning a companion pass in 2018. Luckily, the bonus on the Southwest Business card is $60,000 points. This is exactly what I needed to reach our goal! For anyone that may have forgotten, to earn a companion pass you need to earn 110,000 Southwest rapid rewards points in one year. From January 2018 thru October 2018, we had earned 49,500 points using our original Southwest card that we have been using for five years. I noticed this stat, and automatically made an adjustment to our plan. I knew that 60,000 Rapid Reward points would earn us the companion pass for a whole year. Interested in signing up for the Southwest Airlines Visa? Click here. We cut it close, but on December 26, 2018 I earned the companion pass for 2019 and my wife can fly on every flight with me for free. Below is a look at our current steps towards earning credit cards rewards. Since the beginning of this journey in October, we have earned 119,344 reward points. Currently, we have not used any of the Ultimate Rewards points, but we have used almost all of our Southwest Rapid Rewards Points. Once earning the companion pass, I booked multiple flights for my family with points and the companion pass. Below is a list of flights purchased, and what it would have cost us without points. Based on our experience so far, we have spent a grand total of $155 and booked 5 round trip flights that would have cost us $2,271 for the five flights. That’s a savings of $2,116 (2,271-155)! With my family living in Nebraska, we will always be traveling to visit family. Travel rewards allows us to make this travel while also saving money. This rewards travel yielded us a 2.63 cents per points redemption. A 2.63 points per redemption is really good in travel rewards. Most point redemption averages 1.5 cents per point on Southwest flights, according to The Points Guy. We fared better than the average, because of the free flights earned from the companion pass. Some of you may be skeptical like I was about travel hacking, but the amount of money that you can save is amazing. In my honest opinion, it hasn’t been too much extra work. It does take a little bit to coordinate cards and switch cards when I need it or my wife needs it, but I would take a little extra work for a 2,000 tax free bonus! Reaching the Financial Summit, Begins with you!